Titanium alloy materials are widely used in the aerospace field because of their high specific strength, low density, corrosion resistance, and high temperature resistance. But by Due to its low thermal conductivity, low elastic modulus, and high chemical activity, titanium alloys have high cutting temperatures and tool wear during processing. Severe, etc., affect the processing efficiency of titanium alloy, so how to improve the cutting efficiency of titanium alloy has always been an urgent need to solve the aerospace industry problem. 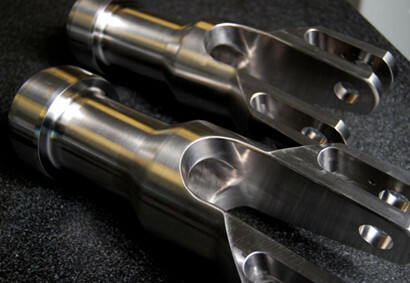 The key to successful titanium prototype machining is “process development” in which the machine tool, the cutting tools, the machining processes and the right cutting strategies are brought together to match the material properties of the selected grade of titanium. (1) High specific strength: Titanium alloy has small density and high strength, and its strength is greater than that of ultra-high strength steel. (2) Poor thermal conductivity: The thermal conductivity of titanium alloy is small, and the coefficient of thermal conductivity is small, so it is difficult for heat to be transferred out of the chip area, resulting in the temperature of the cutting edge of the tool. The higher the degree of wear of the knife, the lower the tool life. (3) The chemical properties are lively: The titanium alloy reacts with O, N, H and other elements in the air to form a work hardening layer under high temperature conditions. Makes cutting difficult; at the same time, the titanium alloy is easy to produce affinity with the tool material during processing, and the phenomenon of adhesion and diffusion occurs, resulting in a tool Wear faster. (4) Small modulus of elasticity: The rebound of the workpiece during cutting is large, which may cause the wear of the tool flank and the deformation of the workpiece. (5) Corrosion resistance: A dense oxide film is easily formed on the surface of the titanium alloy below 550 °C, so it is not easily oxidized further, to the atmosphere and the sea. Water, steam, and some acid, alkali, and salt media all have high anti-corrosion capabilities. In the machining process, the selected tool materials, tool geometry and cutting parameters will affect the efficiency of titanium alloy cutting and machining. Economical, its processing principles are as follows. The tool material is an important factor that influences the cutting process, so as far as possible, use hard and good wear-resistant tool materials, such as carbide cutting tools, coated tools and high speed steel tools. When cutting difficult-to-machine materials, the proper tool geometry helps to maximize tool cutting performance and improve cutting efficiency. Machining titanium: There are three deformed areas in gold. (1) Basic deformation area I: Large deformation, cutting force and cutting heat mainly from the area. By maintaining a sharp edge, arc transitions, etc., Reduce the friction coefficient and cutting temperature of titanium alloy processing to avoid sticking and chipping. (2) Friction and cutting area of ​​chip and rake face II: It directly affects the rake face wear of the tool. By selecting a smaller rake angle to increase swarf and the length of the rake face reduces rake face wear. (3) Worked surface and flank wear surface deformation area III: It has a great influence on the work hardening and tool back surface wear. By choosing the larger relief angle reduces the friction between the flank and the machined surface. (1) Turning parameters should use low-speed cutting as much as possible, large depth of cut. For roughing, cutting speed 45~70 m/min, feed 0.10 to 0.15 mm/r; for finishing, cutting speed 80 to 100 m/min, feed 0.05 to 0.10 mm/r. (2) Clamping force during finishing is not too high Large, reducing the amount of deformation of machined parts. (3) After machining, press the last pass on the contour of the part. The route is reprocessed once to eliminate the deformation of the part caused by the cutting force and to make the knife. (1)Climb milling is generally adopted, and the depth of cutting is as follows Larger and Smaller, the chips are thicker and thinner, and the thin side always leaves the teeth at the end. The chips are easily broken and the tool life is improved. The impact on the processing quality is small, should choose large depth of cut, small feed, low speed; finishing should reduce the processing distortion, improve the surface quality, using High speed, small depth of cut. (3) After the titanium alloy is processed, a hardened layer of 0.1 to 0.2 mm will be formed on the processed surface, so the secondary depth of cut should be Greater than 0.2 mm; allowance for unilateral roughing should be greater than 0.2 mm. TC4 titanium alloy processing is very difficult, titanium and titanium alloy synthesis process in the crystal structure, physical properties and chemical properties, etc., with steel, aluminum alloys and many heavy metals are very different, the following three factors determine the titanium alloy is a poorly processed metal. (1) Due to the instability of its chemical composition. TC4 titanium alloy will react with oxygen and nitrogen under thermal deformation, even with Some oxygen-containing gases react chemically. The reaction produces oxide scales that adhere to the surface of the workpiece. If the temperature is higher, it reaches temperatures above 900°C. (2) The performance of cementite in the metallurgical structure belongs to a complex Fe-C compound with Vickers hardness up to HV1100., and impact toughness is almost nothing. (3) The thermal conductivity is not high: the thermal conductivity of the titanium alloy is only about 1/15 of that of the aluminum alloy when compared with other alloys such as aluminum alloys. About 1/5 of steel. The thermal conductivity and thermal conductivity of titanium alloys are much lower than that of aluminum alloys and steels, and they are only about 1/15 of that of aluminum alloys. About 2/7 of the impact on the surface quality of some titanium alloy parts is relatively large. UYEE, a professional Titanium machining company based in China, focus on Titanium parts manufacturing services over 10 years. Titanium machined parts are widely used in electrochemical, medical and aerospace industries, contact us by Email (service@uyee-rapidprototype.com) if you are looking for Titanium machining supplier. More quantity, more discount!